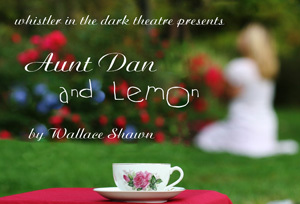 Presents "Aunt Dan and Lemon"
Whistler in the Dark Theatre returns to the intimacy of the Factory Theatre with the Obie Award-winning "Aunt Dan and Lemon," Wallace Shawn’s provocative examination of a shifting moral compass. Performances are set for April 29 - May 21, running in repertory with Mill 6 Collaborative. The Factory Theatre is located at 791 Tremont Street in Boston. Audiences will step inside Lemon's London flat and hear the tale to be told -- a tale from her childhood, when summer evenings were spent listening to her parents' glamorous and cosmopolitan friend Danielle weave stories about her loves and lovers, her escapades and adventures. A quiet and withdrawn child, Lemon escapes into the often seedy world of Aunt Dan's stories. She's lost in the adventure of it, often without fully understanding it. Now reclusive and in her twenties, Lemon mines these remembered stories for lessons and draws startling conclusions as her memories blossom around her, setting the path for her interrogation of the truth of human compassion. The cast features Melissa Barker, Melissa Baroni, Jen O’Connor, Alejandro Simoes, Scott Sweatt, Meg Taintor and Mac Young.